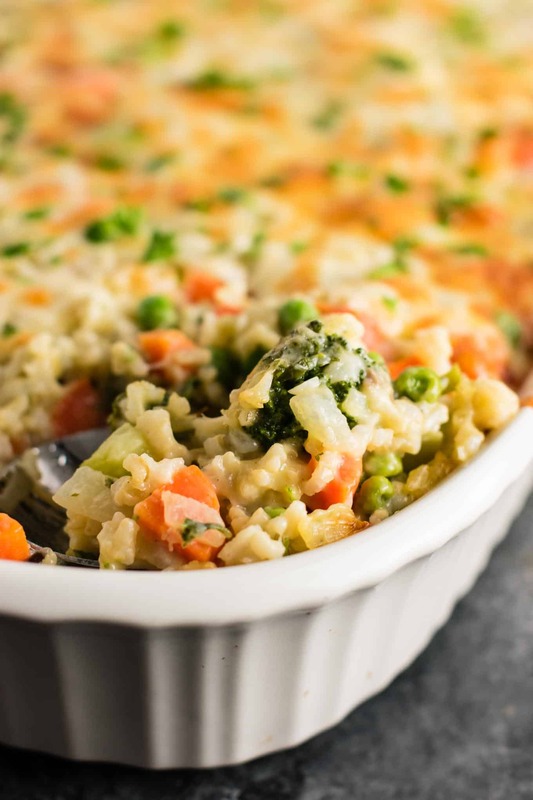 The week before Easter years ago, I did a test run on this creamy vegetable and rice casserole that I planned to make. It has since become a staple recipe in our house, and I make it often throughout the year! Since changing my eating habits, I have found ways to enjoy my old favorites in healthier ways. This casserole has all the amazing flavor of casseroles I used to make, but with none of the unhealthy ingredients. Since first making this recipe, it has now become my go to whenever I am asked to bring a dish to a meal. It makes a huge amount and everyone asks for seconds! Everyone always raves about the flavor, and there are rarely any leftovers! 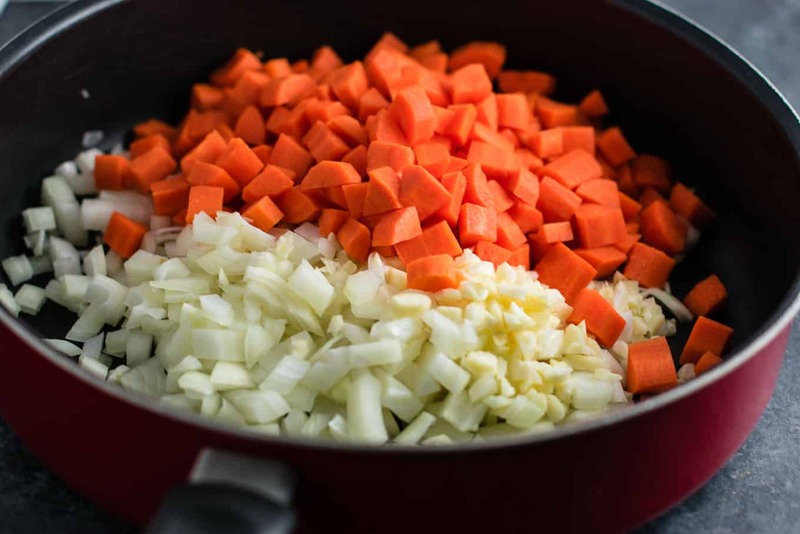 First, you will start with diced up garlic, onion, and carrots as a base. I love tons of fresh garlic and onion, and this casserole is so big that we use lots of it to add flavor. Carrots are the only fresh vegetable that you will need to chop, everything else is just dump it in from the freezer. So simple! While these are cooking, you will measure 3 cups of dry instant brown rice and cook it according to package instructions. If you want to use a rice cooker with normal rice, just adjust for serving sizes accordingly. You will need a very large skillet for this recipe. The one I am using for this recipe is called a Jumbo Cooker, which I purchased from Walmart. I am now on my 3rd Jumbo Cooker in the last 10 years, and I can tell you that it is one of my most used kitchen tools! It isn’t expensive and is my go to for cooking so many meals. I highly recommend investing in one! If you don’t have a big one like this, the last step of mixing the casserole together can just be done in your baking dish. 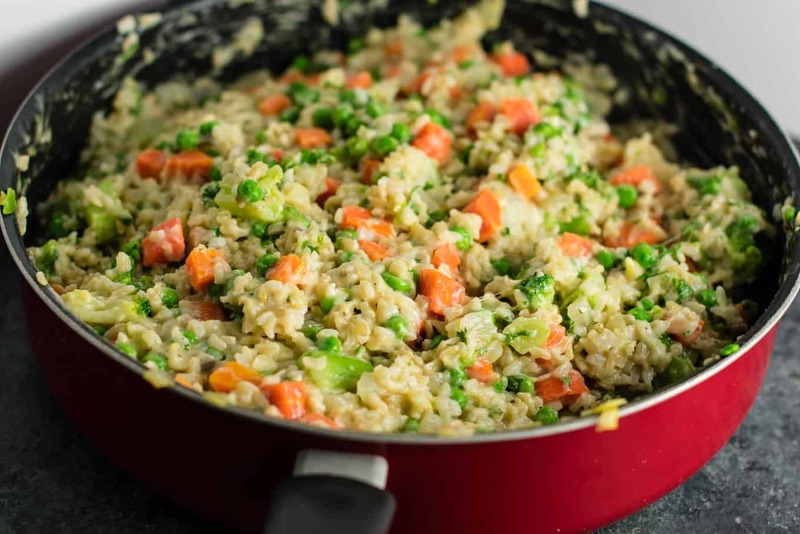 Once the carrot/onion/garlic mixture cooks down a bit, you will add in the cream of mushroom soup, frozen peas, frozen broccoli, 1 1/2 cups of freshly grated parmesan, and 1 cup of freshly grated sharp cheddar cheese. It’s very important to not skip the step of grating the cheese fresh from a block. This adds tons of flavor, and it definitely will not be the same if you just buy packaged pre shredded cheese. Just trust me on this! Freshly grated cheese > pre grated cheese any day. 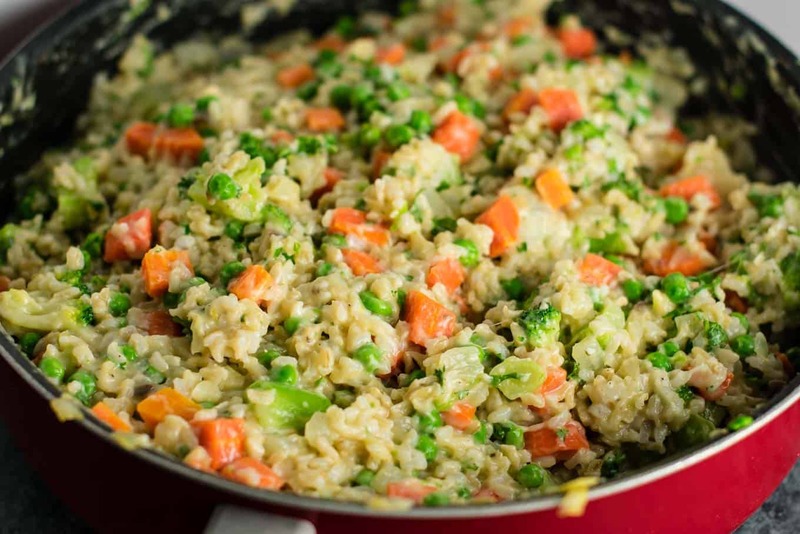 Once your mixture heats up, add in the cooked rice and the chopped up fresh parsley (<— more big flavor here) and stir until everything is all mixed up. 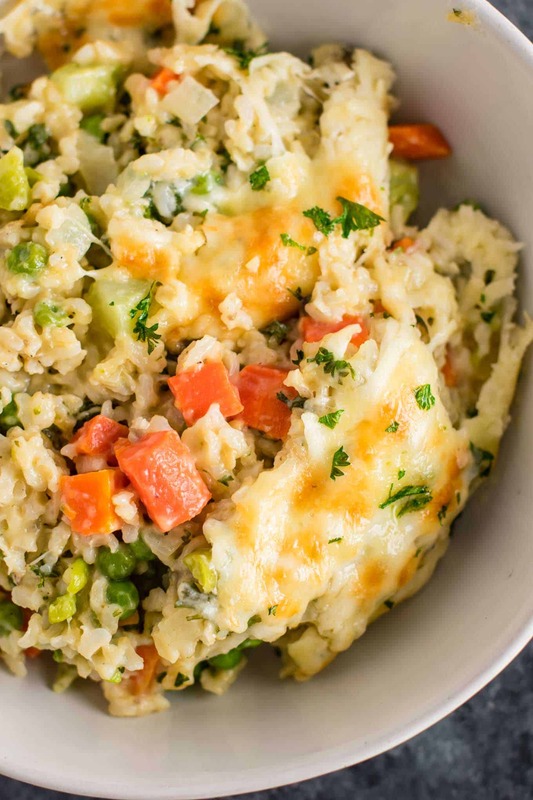 Your skillet should look like this – all creamy, cheesy, and ready for the oven! Taste a bit and see if you want to adjust the salt or pepper amounts at all. (I didn’t). Next up, transfer your casserole to a large 13 X 9 casserole dish. This makes a huge amount, so be sure to use a big dish, as anything smaller will not fit it all. 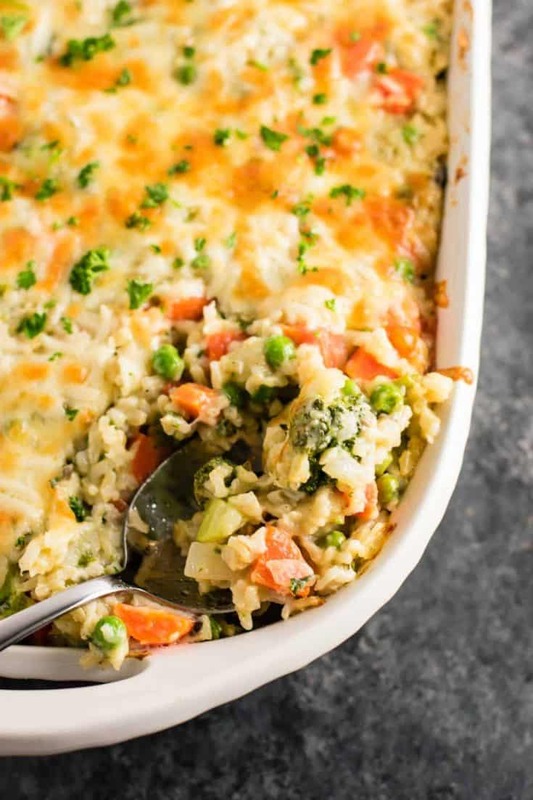 This casserole will easily feed 8 – 10 people as a side dish, it really makes a ton! Top your casserole with the remaining 1 cup each of sharp cheddar and parmesan cheese. Bake at 400 degrees for 10 – 15 minutes, or until the cheese is bubbly and beginning to brown. That’s when you can tell that it’s ready to eat! If you want, towards the end of cook time you can broil the casserole for a minute or two to really get that cheese nice and brown. I love to do this! Those browned cheesy bits are the best. This serves 6 – 8 people as a main dish, and way more as a side. Perfect for large gatherings, and I’ve even made it as a Thanksgiving side dish before! 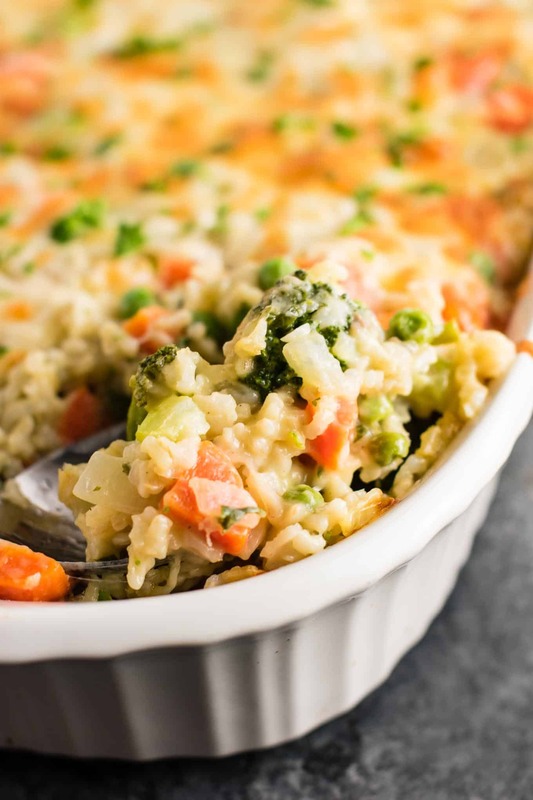 Whether you just want a great side dish, or something vegetarian friendly for everyone to enjoy, this rice and vegetable casserole is it. I have made this countless times over the years and it comes out perfect every time. It’s my signature casserole dish and I want your family to enjoy it as much as we do! 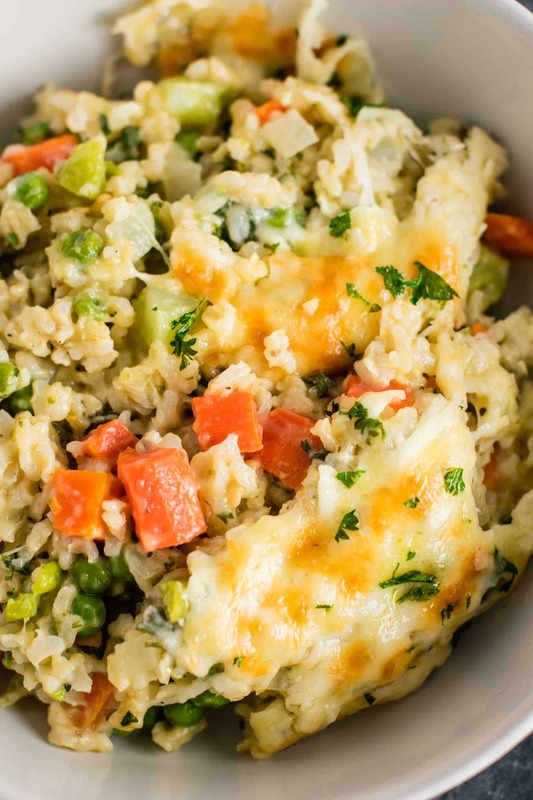 Easy rice and vegetable rice casserole that tastes like a million bucks! Everyone goes crazy for this recipe. 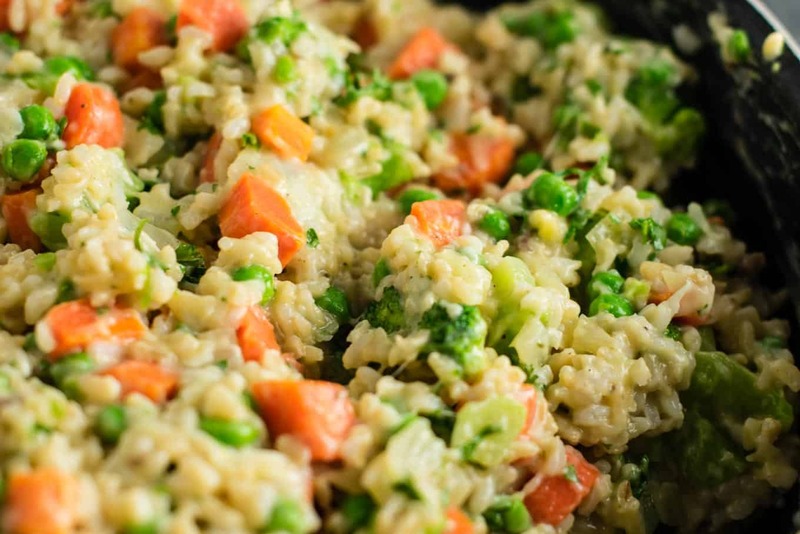 I made this with white rice because of temporary dietary issues – it was wonderful and so easy. It seemed a little dry when I mixed everything together so I added some cream I had in the refrigerator – about 1/4 cup for half the recipe. I will try it again with brown rice soon! I’ve made the half-size version of this several times already, it’s a huge hit with the husband! Used 1 can (18oz) Progresso cream of mushroom soup, and added about 1.5 cups diced rotisserie chicken breast for more protein. Making it again tonight with different veggies! So good, thank you! So glad to hear you enjoyed the recipe Kate! Does the recipie mean 3 cups of uncooked rice, or 3 cups of cooked rice? Definitely! This would be a great dish for freezing. I made this tonight for dinner. My teenage daughter, who turns her nose up at everything, LOVED IT. in fact she made sure I kept the pin and said to rate it 5 stars (I did). I only swapped out brown instant rice for regular long grain white because that’s what I had on hand. Thank you very much for this great recipe! Love hearing this Tammi! So glad your family enjoyed the recipe!